Kitchen remodeling trends change from year to year, and every few years there are major shifts in trends. In the early-to-mid 2000’s, stainless steel appliances were all the rage. While stainless is still a very nice option, some trendy designs are leaning toward everything from painted, to specific designs, like southwestern. From the color of your walls, to the color and style of the tile, back-lighting, and even your appliances, the entire composition of the kitchen should match. But what about your countertops? Your countertop should pull the entire kitchen together, and it is a main focal point, and big selling point in real estate as well. 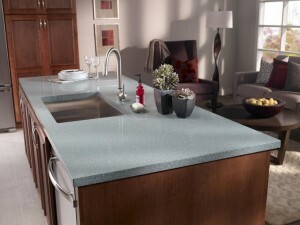 Breit’s specializes in a wide range of countertop materials that fit every size kitchen and budget. You can choose from Laminate, Corian, Granite, and even Quartz. We make the process easy! You can simply take a few photos of your counter, create a rough drawing of your kitchen, and provide us with dimensions, and we can give you an idea on cost over the phone! To get started, click HERE and you’ll be directed to our Countertop Page. Scroll down to find a form where you can upload your drawing and pictures. Please call us at 216.651.5800 with any questions! Kitchen remodeling is one of the most popular and valuable home renovations available to homeowners. Updated kitchen designs, new appliances, adding storage space, updating old or deteriorating plumbing and electrical, and adding new features are all good reasons to update. 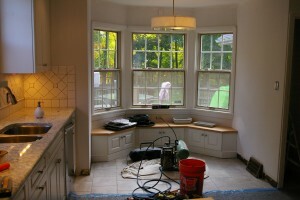 In addition, remodeling your kitchen returns more on your investment than most projects. According to Remodeling magazine’s annual Cost vs. Value Report for 2018, a kitchen remodel can return between 71% and 81% of the initial cost! Let’s face it, the colors and designs of yesterday are painful to look at. According to Sherwin Williams, peoples thought on color changes about every 7 years, meaning there are always new designs to consider. The same goes for tile, countertops, and cabinets. That dark blue cabinet you fell in love with 5 years ago no longer has the same appeal. On top of that, if you are trying to sell your home, stay neutral in color! Your design style may not match up with your potential buyers. New appliances are extremely nice to have, but what happens if they do not fit your current space? Breit’s has the expertise to redesign your kitchen to accommodate not only the new appliances, but also move outlets. Out team of experienced craftsmen are highly skilled at electrical and wiring, and can help hide existing outlets, or add more outlets if you are short a few. We all would LOVE more cabinet and countertop space! But sometimes purchasing standard cabinets from a big box store isn’t good enough; cabinets are cheaply made, only come in certain sizes, and many times are not even finished, ugh! Since 1948, Breit’s has designed and built custom cabinets, from framed to frameless, we do it all. We feature a very large in-house woodworking shop where our work is done. We also use computer aided design tools to help visualize your kitchen before we begin! Plumbing and wiring does go bad over time. Faulty wiring is the leading cause of house fires according to a 2009 study by the National Fire Prevention Association. Rewiring your house, or even your kitchen is not a good idea for a DIY weekend project. The cost to repair or replace a poor wiring job can far exceed the original cost. However, the benefits of upgrading wiring and plumbing are very good things a homeowner can do to add value and safety to the home. Wouldn’t you love to add a new island in your kitchen? Or maybe a new appliance like a dishwasher or trash compactor, and your current layout will not accommodate it. How about a beautiful new Lazy Susan? We offer a Lazy Susan that is 28 inches in diameter, the doors fold in, features a frameless cabinet and is a perfect addition to any kitchen! An easy way to make a window seat from 12″ high wall cabinets, is to make a toe kick out of 2 x 4’s build the cabinets up and make the seat out of veneer or laminate with a wood edge. In this one I used baseboard that matched and painted end panels. The seat is roughly 16.5″ high, making it near perfect for an existing table. The idea is to make kitchen cabinets look more like high end furniture without the added cost.